Airbus and the leading tractor manufacturer John Deere, have received a Silver Medal during the 2019 SIMA Innovation Award ceremony for Live NBalance, a service merging satellite and tractor data in order to monitor intra-field nitrogen (N) balance even more precisely during the growing season. The companies have joined forces to develop and test this new service in 2019. The prestigious Innovation Awards of SIMA (Salon International du Machinisme Agricole in Paris, France) are being given every other year as part of the fair preview. Up to date, no tool has been precise enough to check nitrogen applications efficiency in every place of the field, during the crop growth time period. 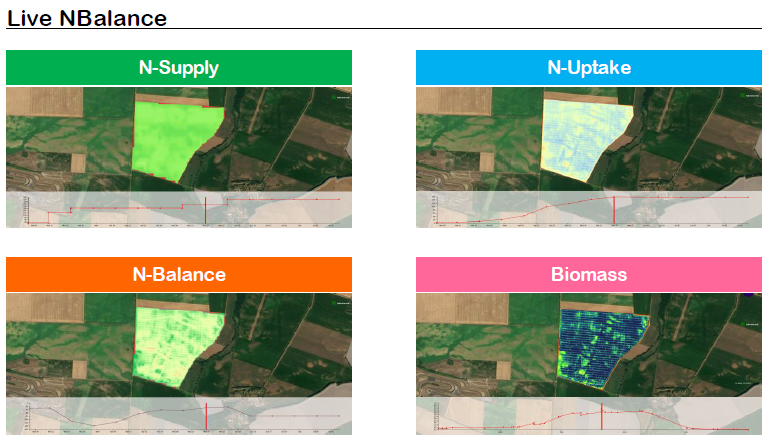 By leveraging farming data from agrarian machine sensors with accurate crop development measurements from satellite imagery, Live NBalance provides an in-season, site-specific nitrogen information via a multisection dashboard (displayed as maps and field average time series). With this tool, farmers can check the amount of nitrogen applied (both from mineral and organic fertilization), the status of nitrogen uptake by the crops, the remaining amount of nitrogen available to the crop, as well as information on biomass. Thanks to this dashboard, farmers can precisely evaluate fertilization efficiency and vizualise the precise extent of potential deviations in the field, which is essential to clearly identify possible issues. They can then adapt and readjust next nitrogen applications, and review, after harvest, the entire cycle to perfect their fertilization strategy for next seasons. A beta version of Live NBalance will be tested in 2019 with a selection of early adopters willing to further explore the potential of the tool.